One of my favorite things to bake is a good, sweet, quick bread. Quick breads are easier than a cake (no frosting or fiddly work) and way quicker than a bread (no kneading, no rising). And they can easily be served for either dessert, breakfast, or a snack. How great is that! I often see recipes with a pairing of lemon and blueberries and that is a combination that I always enjoy! However, I also really like raspberries. They’re sweet and tart and they also go so well with lemon. 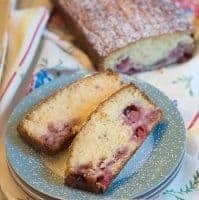 That’s why I used them in this delicious Lemon Raspberry Bread that I’m sharing with you today. This bread mixes up quickly and after baking it’s drenched with a lemon and sugar glaze. The day after I baked this loaf, we had guests over and I served slices of this quick bread with a drizzle of salted caramel sauce and a dusting of powdered sugar. Yum! Preheat the oven to 350 degrees. Grease and flour a 9×5 inch loaf pan. 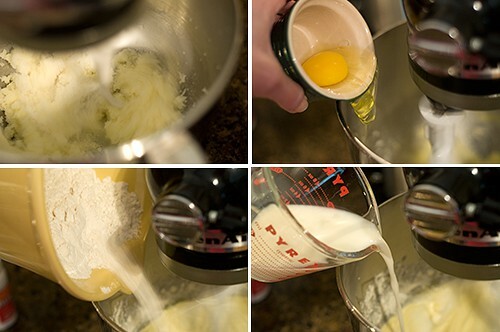 In a large mixing bowl, cream the butter and 1 cup of sugar. Add the eggs one at a time, mixing well after each addition. Add the dry mixture to the creamed mixture alternately with the milk. Stir in the lemon rind and raspberries. Turn into the prepared loaf pan. 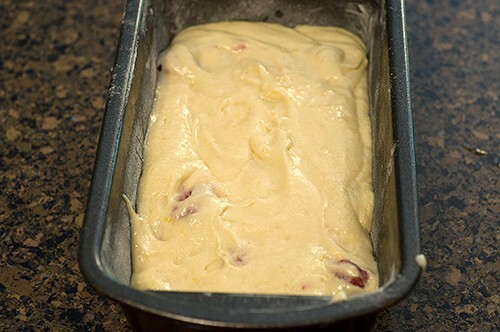 Bake 45 minutes to 1 hour or until a tester inserted in the center of the loaf comes out clean. 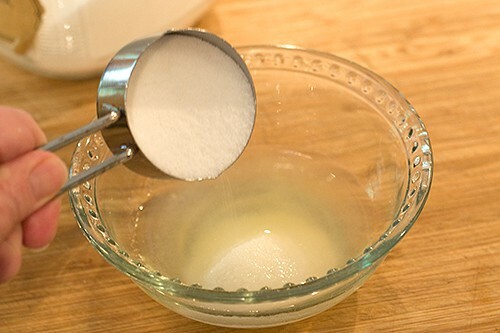 While the cake bakes, stir together the 1/4 cup sugar and lemon juice. Stir occasionally while the cake is baking. The sugar will melt into the juice as it sits. Remove the bread from the oven and pierce all over with a skewer or toothpick. 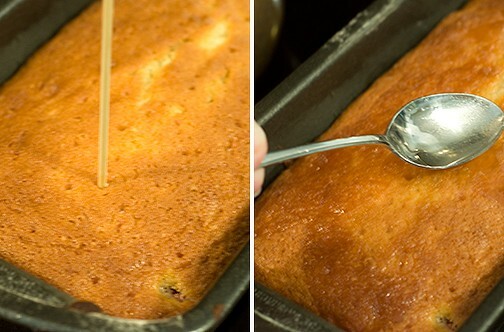 Spoon the lemon glaze all over the cake. Cool for 15-20 minutes. Turn out onto rack and cool completely. Dust with powdered sugar before serving, if desired. 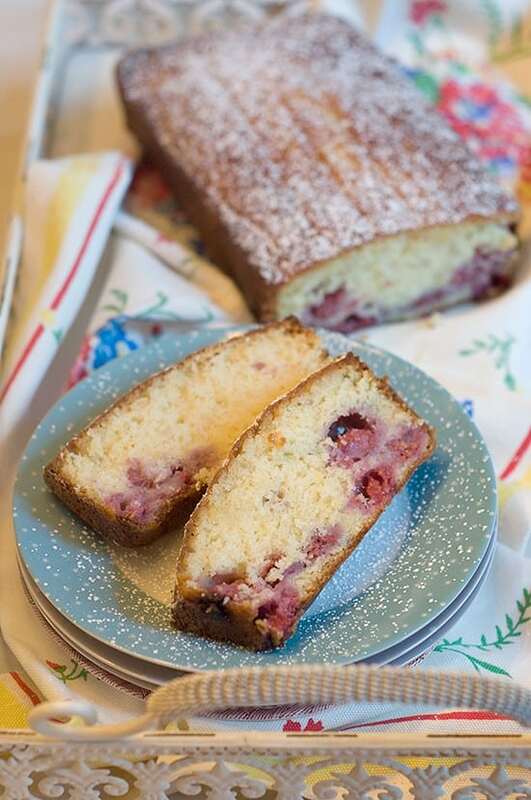 A quick sweet bread that's great for breakfast, dessert, or afternoon snack. Preheat the oven to 350 degrees. Grease and flour a 9x5 inch loaf pan. Stir in the lemon rind and raspberries. Turn into the prepared loaf pan. Bake 45 minutes to 1 hour or until a tester inserted in the center of the loaf comes out clean. Remove the bread from the oven and pierce all over with a skewer or toothpick. Spoon the lemon glaze all over the cake. Cool for 15-20 minutes. Turn out onto rack and cool completely. 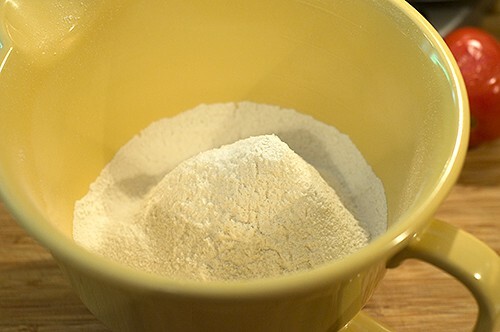 Dust with confectioner's sugar before serving, if desired. Yes, they are. And they’re also good to keep in the freezer for unexpected company. I know I would love this; lemon and raspberry are favorites and together they are simply divine. I love me some tart! They are a great combo, Barb, and I love them together, too! Sounds so good – thank you! Lemon and Raspberries are hubbys’ favourites. Shall be treating him. Thank you for recipie. Hope he enjoys it, Deirdre! Ohhhh yum! Love this flavor combo! Thanks, Stephanie! We love it, too. I also love quick breads and these flavors are absolute perfection! Quick breads are a summer staple in my house. Bless you for including such a healthy amount of lemon zest in this bread. I’m sure the lemony tang perfectly accentuates the sweet raspberries. You’re right, there is a lot of zest in the batter plus that lemon and sugar glaze just adds all that much more! This is such a pretty bread!! And I bet the flavors are so summery and perfect! Thanks, Sues! It is very summery. I love breads where you poke holes and drown it in a glaze! It just makes them so ridiculously irresistible. :) And I love baking with raspberries, too! I just wish they weren’t so expensive so I wouldn’t have to feel guilty about mixing them into batter! Lemon and raspberry are one of my favorite summer combos! Love them in this bread! I can never resist a good quick bread – easy to make and almost always tastier than any other dessert on the table. 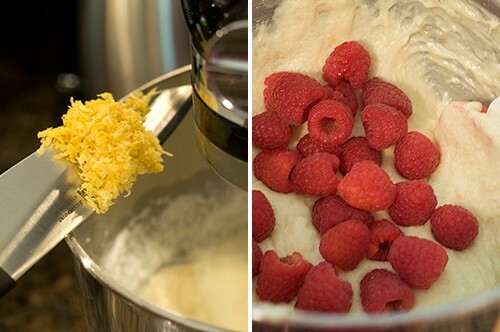 Lemon and raspberry sounds like a fantastic combination! They are, Dara, but I also like them because I don’t care for baking so much. At least all that fiddly stuff with frostings and fillings and such. I do them occasionally, but I’d so much rather mix up a quick batter like this and pour a glaze over it! The fresh raspberries sound wonderful and a perfect treat for weekend guests! This one is particularly good for almost any time of day, too. Breakfast, lunch, dinner, snack…whatever. Quick breads of any kind always remind me of my mother – she always made them because they were a quick and easy way to satisfy a sweet tooth!! This is definitely one she would love! This one is nicely sweet but quite tart at the same time – my favorite! Oh I just love lemon! This would be so welcome, especially in the hot summer afternoons. Glad to see that you are back in the kitchen. I am loving this bread! Perfect for slicing on sunny Sunday mornings! Made this bread this morning and it is amazing!!!! Will definitely make it again! Such a fresh flavour. I added a few spoonfuls of Activia lemon yogurt and a tsp of vanilla to it and came out nice and moist! Thanks for my new favourite recipe! !